The Shade Store welcomes celebrated interior designers Meg Braff, Billy Ceglia and Danielle Rollins for a lively discussion moderated by Business of Home’s Dennis Scully. 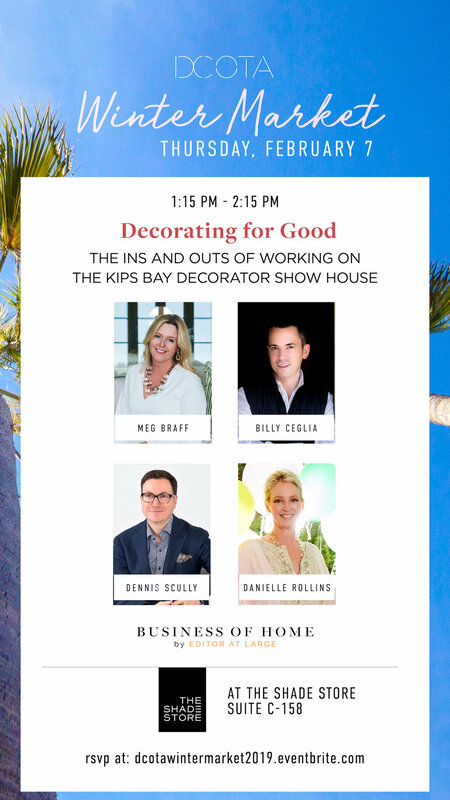 Fresh off completing their spaces in the 2019 Kips Bay Decorator Show House: Palm Beach, the designers will discuss the ins and outs of working on a show house. From tight deadlines, vendor donations, brand visibility and giving back to charity, they will give their advice and best practices, as well as show off their beautiful spaces. The panel discussion will be following by a book signing with Meg Braff and Danielle Rollins.